Alan L. Zegas and associates practice criminal, appellate, and commercial litigation in the State and Federal courts of New Jersey and New York. Over the years, Alan L. Zegas has been involved in some of the most prominent cases litigated throughout the country. Among his many cases, he has served as: counsel to the government’s key witness in the recent “Bridgegate” case; co-counsel to former Newark Mayor, Sharpe James; counsel to the chief of staff to former New York City Mayor, Edward Koch; counsel to a defendant in the “Glen Ridge” sexual assault case, which was written about in a best-selling non-fiction sociology book used in college courses; counsel to Kelly Michaels, which changed laws throughout the nation about how children are to be questioned in cases involving allegations of sexual assault. In addition to these cases, Mr. Zegas has represented many teachers, prominent business people, and others, from all walks of life. In addition to an active trial practice, Mr. Zegas has an extensive appellate practice in the federal and state courts. He has argued cases before the New Jersey Supreme Court, the New Jersey Appellate Division, the United States Court of Appeals for the Third Circuit, and the United States Court of Appeals for the Second Circuit, and hundreds of his cases have resulted in published decisions. U.S. News & World Reports and The Best Lawyers in America have included Mr. Zegas and his law firm in their 2017 rankings of top law firms in 3 separate areas of practice: Criminal Law: White Collar Defense; Criminal Law: Non-White Collar Defense; and Appellate Practice. 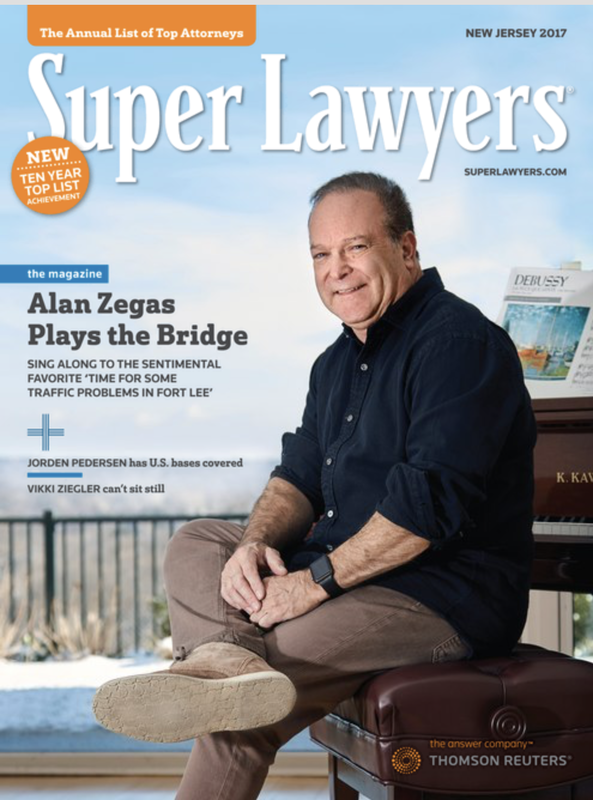 Since its inception, through 2017, Super Lawyers, based upon peer review surveys, has named Mr. Zegas in its listings of New Jersey’s “Super Lawyers.” In its lists for two of those years, Super Lawyers named Mr. Zegas in its lists of the top 100 attorneys in New Jersey. For more than two decades, the Martindale Hubbell Bar Register Bar Register of Prominent Attorneys has awarded Mr. Zegas an “AV” rating, the highest an attorney may receive, and Digital Press International has recognized Mr. Zegas as being among the top 10 criminal defense attorneys in northern New Jersey. In 2009, the Institute of Continuing Legal Education gave Mr. Zegas its award for distinguished service to the Bar. Mr. Zegas is a regular lecturer for the Institute in the areas of Criminal Law, Criminal Procedure, Evidence Law, and Appellate Practice. Mr. Zegas has appeared on 60 Minutes, and he has been quoted as a legal expert by newspapers and magazines across the country, including The New York Times, The Wall Street Journal, Business Week, The Star Ledger, The Philadelphia Inquirer, and The NJ Law Journal. Mr. Zegas has also been featured on TV and radio news programs of major broadcast stations nationally. Mr. Zegas, who received an MBA degree from the Harvard Business School, and a B.S. degree from the Wharton School at the University of Pennsylvania, has served as the editor of "NJ Criminal Procedure", published by Lexis/Nexis, and serves as the co-editor of "New Jersey Evidence", published by Gann Law Books. He has served on the adjunct faculty of Rutgers Law School-Newark and as Editor-In-Chief of the Rutgers Law Review. He also served as a grader for the New Jersey Bar Examinations. Mr. Zegas sits by designation on the Evidence Committee of the New Jersey Supreme Court. He has previously served on the Court’s Criminal Practice Committee and Criminal Jury Charge Committee. He has also served on various subcommittees of the New Jersey Supreme Court. Mr. Zegas is a past trustee of the New Jersey State Bar Association, a past President of the Association of Criminal Defense Lawyers of New Jersey, and a past Chair of the Criminal Law Section of the New Jersey Bar Association. He currently serves on the editorial board of the New Jersey Law Journal. Named Best Lawyers in America, Best Lawyers in New Jersey, Superlawyers, Martindale Hubbell Bar. Register of Preeminent Attorneys, and Who's Who in America. 2009 recipient of the award for Distinguished Service to the Bar by the Institute for Continuing Legal Education. Named as one of 50 most interesting people in New Jersey by New Jersey Monthly Magazine, for work as an attorney. Has sat by designation of the New Jersey Supreme Court on various of its committees, including the Court's Evidence Committee, Criminal Practice Committee, and Criminal Charge Committee. CALI Award for Highest Grade in Election Law. Finding the right attorney to represent you is not a choice to be taken lightly. That’s why we offer consultations to walk through your needs, the scope of your goals, and your budget.